About Higher Level Sound | way above the level. Higher Level Sound consists of six members which are coming from Saarbrücken and Bad Kreuznach. The Sound set it’s goals in presenting Reggae, Dancehall and all kinds of caribbean music in a genuine way. Dancehall, Reggae, Rocksteady, Ska, Dubplates; You name it, we have it! The sound starts in 2003 with the original members Daniel, Mr. Six and Spanni. After 2 years, in 2005, Spanni left the sound in peace and start focussing in building exclusive remixes for the Sound by his new name „Remix Blends“. The same year Kai Kong and Isa from the longtime Saarland Veteran Sound „Terrible Charge“ became also members of the sound. 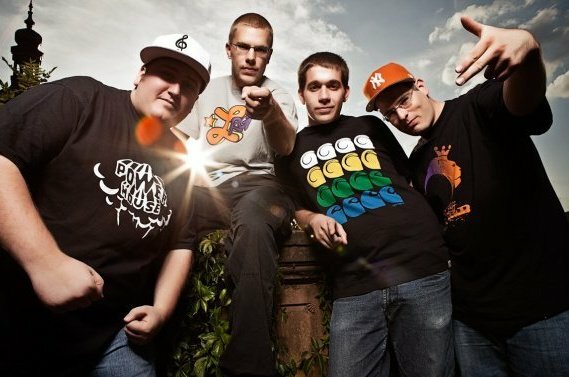 At the end of 2006 Schiffer and Belly Ranx from the sound „Assegai Hifi“ from Bad Kreuznach decided to join forces with the other guys too build up a way more powerful sound and represent the very southwest of germany in a unity. Higher Level can possess a longlasting experience and nuff nuff Bookings all over germany and the near foreign. So from you want your dance get ram, make sure Higher Level’s on the program. Erstmal wollt ich euch ein riesen Big Up für euren Blog geben. Ich besuch den fast täglich und finde das nice was ihr postet. Ich hab seit gestern auch einen eigenen Blog, um Leuten eine Plattform zu bieten Musik zu hören und Infos zu erhalten. Ich habe euch schon bei mir Verlinkt und wollte fragen ob ihr mich auch verlinken könntet. Das wäre super nett. Danke und viele Grüße aus Dresden.